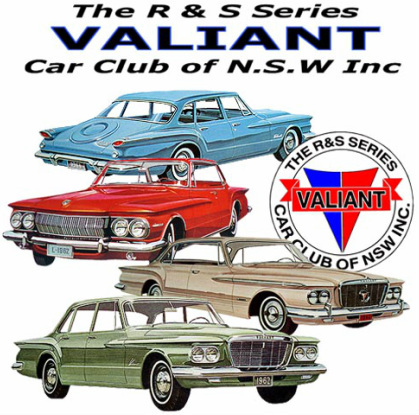 R & S Series Valiant Car Club of N.S.W Inc. Welcome to the R&S Valiant Club of NSW. Our club is dedicated to the restoration and preservation of those fine examples of automotive design and styling prowess - the 1962 VALIANTS. From their shining grilles, to their stylish fins, these cars turn heads wherever they travel. Our Club has been around since 1978, and is open to owners of original or modified vehicles. Our membership is around 60, and comprises Q,R and S Series Valiants, and also Dodge Lancers of the same period - 1960-62. We produce a bi-monthly magazine for members with a list of club events, which includes various shows and swap meets, as well as general outings. Technical write-ups and tips, etc, are also included. We attempt to help members with parts location and are always looking toward the possibility of reproducing parts for members. For those interested, our Club also provides Vintage Registration, for cars not driven regularly.